On a warm August day at Bastion Square Market, having a delicious fruity ice pop from Fruition Paletas certainly hits the spot. The availability of certain flavours are seasonal, and I can easily see some ice pops sell out faster than others. The richness of the fruit and creaminess of the base product certainly had me polishing off the fruit on a stick in no time. As August was ready to fade away and I was at the Intrepid Theatre looking to buy a few tickets to the Fringe Festival, I was told there was an “ice cream” shop nearby. Much to my delight was this operation’s storefront. Not many cart operations actually have a store to operate from and to know where I can get my fix without having to hunt is great. But as the Fall season approaches, the choices may become a bit more limited when their storefront closes for the season (September 29th). They’ll be open again in April 6, 2013. It’s a bit of a shame. As a few winter fruits come in, will any of them translate well into a ice pop? The Spring and Summer season is when this storefront flourishes. I’m a sucker for exotic berries like logan, blue and huckle. During the warmer parts of the year, the storefront keeps regular hours. 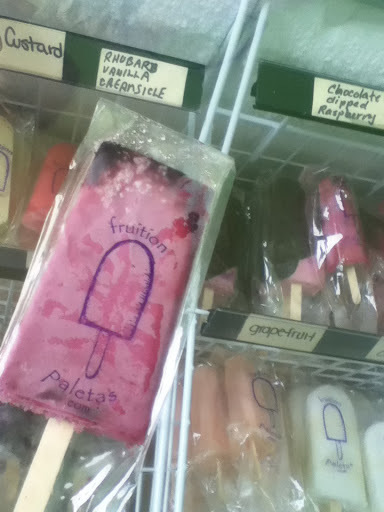 But for Fruition Paletas to keep going during the slower months, I imagine they do more catering. The owners have stated on their sign at the store that during the slower months, they will be working on developing new products and flavours. That’s a bonus for those parties, weddings and Bar Mitzvahs who are doing private orders. If they only remained open for another month during the next season, can anyone imagine a decadent lightly spiced pumpkin flavoured ice cream for dessert? I can. This entry was posted in Food, Reviews and tagged British Columbia, Desserts, Vancouver Island, Victoria. Bookmark the permalink. ← A West Coast romp by the Sea, Fish n’ Chips in Jordan River and other points in Between.